Fenrir Password Decryptor is a free tool to instantly recover your lost 'Fenrir Pass Connect' password stored by Sleipnir browser. 'Fenrir Pass Connect' is a cloud based service used by Sleipnir browser to store and sync various user details such as bookmarks, mobile numbers across various devices. 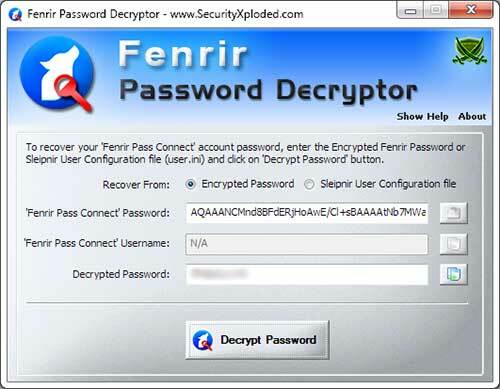 If you ever forget Fenrir password then 'Fenrir Password Decryptor' can help you to recover the same. It supports dual mode of password recovery. You can either enter the encrypted Fenrir Password directly or specify the Sleipnir Browser Configuration file (user.ini). On start, it will automatically discover Sleipnir configuration file and display the same if its already present. This is very handy tool for all Pentesters and Forensic Investigators as it can give access to user's 'Fenrir Pass cloud storage'. Fenrir Password Decryptor is tested on both 32 bit & 64 bit windows systems starting from Windows XP to Windows 8. Here is the sample format of Fenrir username/passwords stored in this 'user.ini' file. Here Fenrir Password is stored in encrypted format using Base64 encoding and Windows Crypto Algorithm. Fenrir Password Decryptor comes with Installer to help in local installation & un-installation. This installer has intuitive wizard which guides you through series of steps in completion of installation. It is very easy to use tool with its nice GUI interfaceusers. Run 'Fenrir Password Decryptor' on your system after installation. Select 'Encrypted Password' option if you have the password else select 'Sleipnir Configuration file' if you have the configuration file. Finally click on 'Decrypt Password' button and tool will instantly recover and display the original Fenrir Password as shown in the screenshots below. Screenshot 1: Fenrir Password Decryptor is showing the recovered Password from the Sleipnir Browser Configuration file. 'Fenrir Password Decryptor ' is designed with good intention to recover the Lost Fenrir Account Password. Like any other tool its use either good or bad, depends upon the user who uses it. However neither author nor SecurityXploded is in anyway responsible for damages or impact caused due to misuse of Fenrir Password Decryptor . Support for automatically copy the recovered 'Fenrir Pass Connect' account password to clipboard. First public release of Fenrir Password Decryptor .